Watch an exciting game of stickball at Diligwa, a 1710 village at the Cherokee Heritage Center in Tahlequah. Tahlequah is a city rich with history and Cherokee heritage. Nestled within northeast Oklahoma, Tahlequah was founded as the capital of the original Cherokee Nation in 1838, though the city has the distinction of also being the capital of the United Keetoowah Band of Cherokee Indians. Its desirable location in the scenic Illinois River Valley with nearby Lake Tenkiller and Fort Gibson Lake give the area ample opportunities for outdoor recreation. In town, you’ll see Cherokee syllabary along street signs and store fronts, which serve as a tangible link to the city’s roots. Read on to discover some can’t-miss attractions as you trek through Tahlequah. With a museum, education center, rural village and ancient village tour, the Cherokee Heritage Center exemplifies Cherokee pride. One of the most striking and memorable exhibits in the museum is its Trail of Tears display with life-size casts of actual Cherokee tribal members during the forced removal. As you walk through the area, you’ll hear sounds of the wind, as well as women crying. Many of the other exhibits in the museum are interactive. Sit by a campfire and hear a tribal elder tell stories of the old way of life or walk into a cabin where a rocking chair squeaks as the family is rounded up and herded into camps to prepare for the forced march. After touring the museum, head outside to explore the ancient Cherokee village of Diligwa. The ancient village is based on how life was like for tribe members in 1710 and shows how the Cherokee people lived in their native lands in the eastern U.S. prior to European contact. You’ll see 19 “wattle and daub” structures consisting of wet soil and straw, as well as 14 interpretive stations. The village consists of eight residences, each of which has a summer and winter house, corn crib and garden. Tour public areas like the primary council house and summer council house, plaza and two recreation areas. Watch as tour guides dressed in authentic Cherokee regalia demonstrate how dugout canoes were crafted, how to use antlers to fashion arrowheads and how to weave baskets as they would have done long ago. Visitors can even learn if they have Cherokee roots at the on-site Cherokee Family Research Center. You can search the Dawes Roll, read Cherokee Advocate newspapers dating back to 1845 and view cemetery records. Located just off of Tahlequah’s town square lies the Cherokee National Supreme Court Museum. This 1844 two-story brick building has been the home of both the Cherokee Supreme Court and the first newspaper published in Oklahoma Territory, the Cherokee Advocate. In keeping with its rich history, visitors will find three separate exhibit areas dedicated to the court, newspaper and Cherokee language. Within the newspaper section, you’ll see one of the original printing presses and copies of the newspaper printed in both English and the Cherokee language, while the Supreme Court exhibit displays hand shackles and information on Justice John Martin, known as the first Chief Justice of the Cherokee National Supreme Court. Bring the little ones along to play and learn on interactive kiosks within the museum while you read about Sequoyah, inventor of the Cherokee alphabet. From 1875 to 1901, the only official justice carried out within Indian Territory was at the Cherokee National Prison Museum in Tahlequah. An ominous sandstone structure with barred windows and a restored gallows area awaits visitors interested in looking at the lives of hardened criminals from the past. Tour the cells, sheriff’s office, kitchen and blacksmith station to get a feel of the daily lives of past prisoners. An interactive kiosk will even tell you stories of the people who spent time in the prison, while the wheel of justice will show you which punishment would fit each crime during the prison’s operational days. The Cherokee Nation Gift Shop, located next to the Cherokee Nation Headquarters, is your one stop shop for a souvenir made by Cherokee tribal members. Take home a traditional Cherokee basket made with reeds or a beautifully beaded piece of jewelry. Other items available at the gift shop include pottery, books, CDs and apparel. 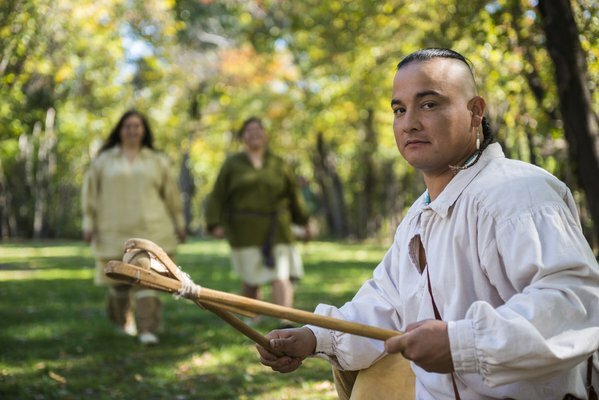 If you’re visiting Tahlequah during certain times of the year, you may even be lucky enough to catch an annual event centered on the Cherokee Nation. Around the second week of April, the annual Symposium of the American Indian presents cultural and scholarly presentations to the public including live performances, games and speakers. From mid-April through late May, the Trail of Tears Art Show, held at the Cherokee Heritage Center, showcases a variety of artwork created by artists from all federally recognized Native American tribes. The Cherokee National Holiday is traditionally held during the last weekend in August. This three day event features Native American games like cornstalk and blowgun shooting, as well as powwows, children’s events and a parade. The Cherokee Homecoming Art Show is also held at the Cherokee Heritage Center and features work from only the citizens of the Cherokee Nation, United Keetoowah Band of Cherokees and Eastern Band of the Cherokees. The Cherokee Homecoming show usually runs from the last week in August through mid-September. Formerly known as the George M, Murrell Home, the Hunter's Home was built in 1845 and is the only antebellum mansion left standing in Oklahoma. It has been designated a National Historic Landmark and is a Certified Trail of Tears Site. George Murrell was a wealthy merchant from the East Coast who married Minerva Ross, niece of the principal chief of the Cherokee Nation, and made the move to Oklahoma with her family during the Trail of Tears. Once part of a large plantation, this huge home with wrap-around porch was lucky to be left standing after the Civil War destroyed most homes in the area. Inside you’ll see remnants of the past including antique furnishings, while outside you’ll see an 1896 smokehouse, springhouse and small log cabin. Whether you’re looking for some high stakes action or just want to have a great meal for a reasonable price, you’ll find it at the Cherokee Casino in Tahlequah. This medium-sized casino is just big enough to make you feel like you’re in a big-time casino, but not so big that you feel overwhelmed. Inside, visitors will find the River City Café, which offers local favorites like fry bread with catfish and hushpuppies. A variety of Cherokee artwork and traditional Cherokee symbols adorn the casino. A trek through Tahlequah isn’t complete without a trip down the Illinois River. Just out of town along scenic Highway 10, you’ll find several canoe and raft outfitters, as well as cabin and camping areas. One of the outfitters, War Eagle Resort, offers a motel with 32 full-size beds, adorable A-frame log cabins with two bedrooms and kitchens, a bunkhouse that sleeps sixty, primitive campgrounds and campgrounds with electric hookups. A swimming pool, a super water slide and lighted sand volleyball and basketball courts are also available for their guests to enjoy when they aren't on the river. The main attraction at War Eagle Resort is the river itself, and they make it easy to get on the river. They offer float trips of varying lengths in canoes, sit-on-top kayaks and rafts. During the summer months, a unique convertible school bus will take you and all the equipment you need upstream where they'll help you get launched. Then you can enjoy the day floating back downstream to the resort. At War Eagle, you’ll have plenty of fun, plenty of sun and the planning is already done. Learn more about floating down the Illinois River here.